"All are good will come again"
Have a question for Fragrance Hotel - Riverside? "This hotel is definitely worth every penny spent." "Good location, friendly staff, will come back !" "Towels & beddings are fresh everyday!" 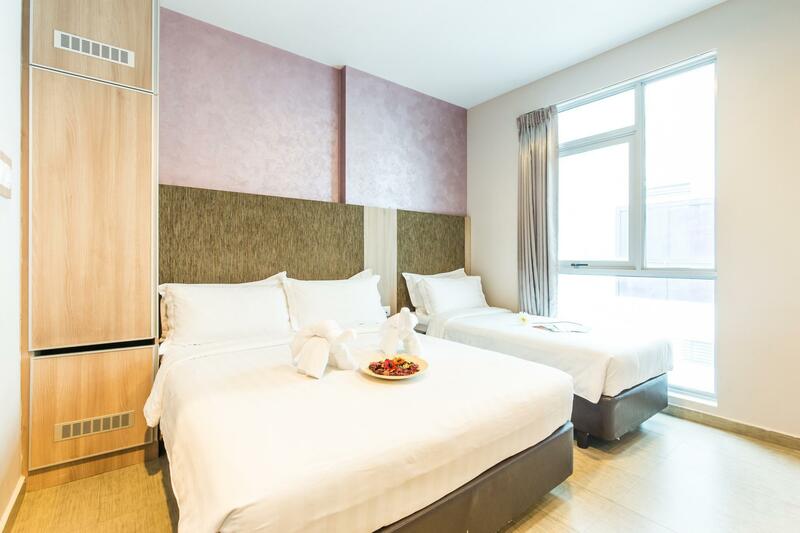 Just a five-minute walk from Clarke Quay MRT Station and within the vicinity of Boat Quay and Clarke Quay is Fragrance Hotel - Riverside. All guestrooms are air conditioned with coffee/tea facilities, a DVD player, and a flat-screen TV with cable channels. 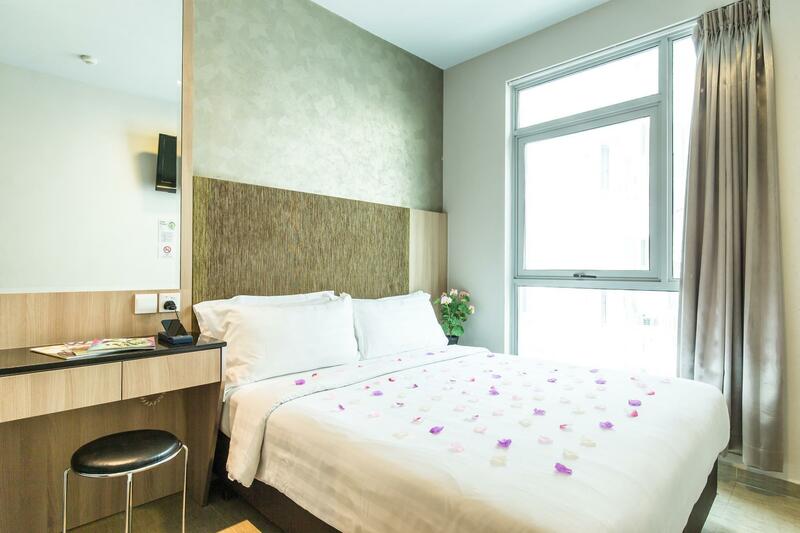 Fragrance Hotel - Riverside offers accessibility to Chinatown district in a five-minute walk, and it's a 10-minute drive to the famous Orchard Road and the Marina Bay area. With easy access to these areas, it will be no problem to visit the surrounding shopping, dining, and entertainment venues. "I got upgraded to executive room, the room is clean and spac..."
The minimum age required for local residents to check in is 18 years. Guests must provide a valid form of government regulated identification (eg. original passport, photo ID card) upon check-in. The property does not have bathtub, video game console, clothes dryer, washing machine, in-room safe box, refrigerator and slippers in all rooms. Room size is the key issue but this is a budget hotel in Singapore. Our 'executive room' would not please many executives but was OK for 3 nights. Location is perfect, good air con and fair sized bathroom. Taxi in from the airport was $25 and worth it for door to door. Wifi only worked if you stood by the door of the room. More good points than bad! I got upgraded to executive room, the room is clean and spacious, has all the basic amenities. Location is superb, just 5 minutes walk from Clark Quay mrt station. (Exit A) There is 7-11 just downstairs so it’s really convenient. However, breakfast is only so-so and i hope there’ll be improvement next visit. Swimming pool is great for a quick swim but the gym facilities is too small and the treadmill is not working. Would definitely come back here again. 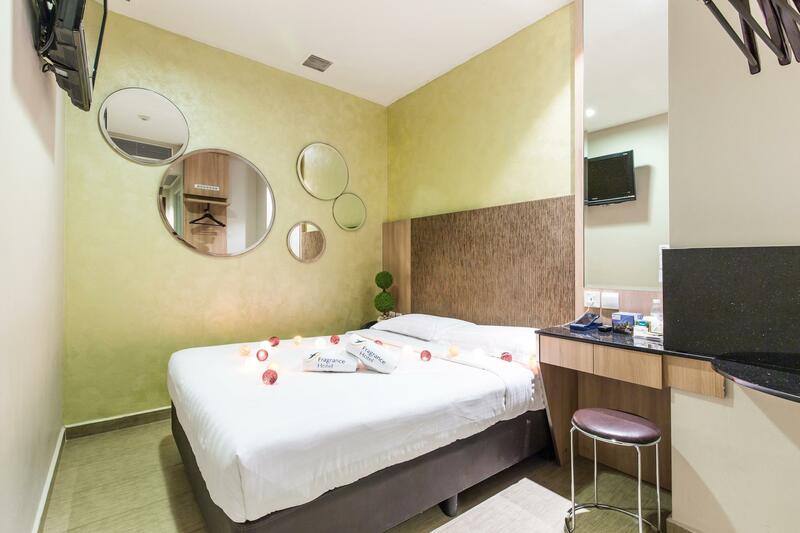 The location is very good, just short walking distance to clarke quay MRT. The hotel size is a bit small, just like typical hotel in singapore. Good value consider its location. Across Road from Clarke Quay MRT and easy to walk to China town and central Singapore. Be prepared for rooms to be small (like most Singapore rooms). Worth upgrading to executive room (which is still small at 13m2 but has small fridge and window. Very friendly and helpful staff and good swimming pool. The rooms were pretty bad as the aircon didn't work. The staffs are not very receptive and not accomodating enough. Took them so much time to fix the problem and make a transfer to another room at a very late night. The room is very small, there are only toothbrush and toothpaste available in the bathroom. They even never put a label for shampoo and shower gel, how we going to know which one to use? The mattress not soft at all too. Looks like a love hotel. The staffs were watching our every movement. And need to register for visitor even we are obviously one family, still need to waste our time to register at counter. Staff was unfriendly at check-in & did not bother to explain the rules. I had some friends over and they chased us out. After the incident, the service was very bad as the staff treated us like criminals and could not wait for us to leave. Never have I ever encountered such unprofessional service staff. At 11.30am, they 'reminded' us to leave the hotel. The hotel is very small, despite paying a high price for it. Booked a deluxe twin room but I got a executive room instead. If the hotel can't promise what the customers paid for, then don't promise it in the first place!! P.S. Can't even open the luggage on the floor. There's other value for money options in the vicinity with better facilities; just go there. the hotel is just opposite to Clarke Quay MRT. From Clarke Quay Sentral, use the overhead bridge to cross to another side, that is Carpenter Street, walk another 2-3 minutes, the hotel is located in Hong Kong Street, which is opposite Maybank. Cleanliness is OK. Although the admin made us signed an agreement for no smoking and the kettle should be used only for boiling water, i don't really see how useful it is - i still smell smoke within the same floor where i stayed, and perhaps a water cooler machine will be more useful to avoid misuse of kettle. Singapore is an expensive place to be so when you find your self a hotel like Fragrance it makes you happy. Very friendly staff, not a big room but anything you need is there. Nearby Singapore River with all the tourist things to do and also nearby an MRT station. Finaly when you come back after a long day at Singapore you can cool down at the swimmingpool on top of the hotel. We will defintely be back at the Fragrance hotel when we come to Singapore again. We were booke a triple room for 2 adults and 2 young kids. The room size is okay for 1-2 nights stay. REMEMBER not to bring 25" and up luggage, your won't have enough space. Bring cabin size luggage, it suit the room size well. Stollers must be folded for sure. Soap, shampoo, toothbrush, shower cap, tea, coffee and kettle are provided. Very near from Clarke Quay MRT exit A. Theres a Killiney cafe, 7-11 adjecent to this hotel. Pool was okay with a view of singapore modern building. The mini gym is oke, just treadmill and elipticall machine. Overall great stay. Room is small, you might find it difficult if you have big suitcase(s). 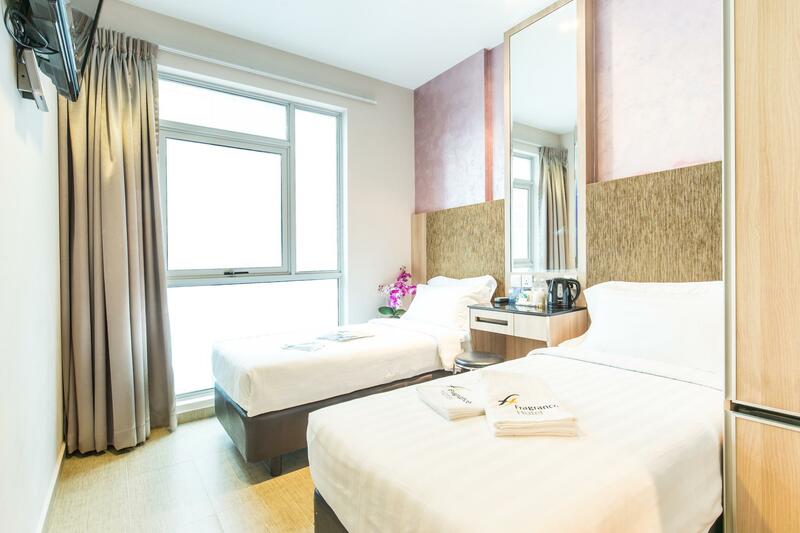 But the room is very clean, and location is very close to Clarke Quay MRT, or within walking distance too from Chinatown MRT. Staff were very nice, and they upgraded our room when we arrived. Thanks. very recommended. Great room for economical travelling with friend. 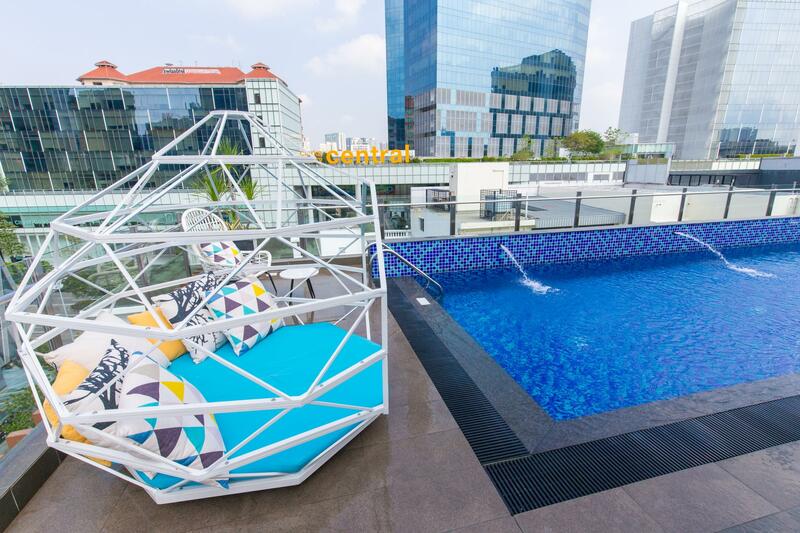 7eleven is near the main entrance, MRT station in a few minutes, 30 minutes to City Center, very quiet atmosphere, possibility to have a good breakfast and keep your bags until evening after check-out, and of course salvatory swimming pool on the roof. But, there was not quite good air conditioning, windows couldn't be open. Anyway, these disadvantages weren't critical. This was my first time with my two children in Singapore. I have read so much about all reviews. I was scared at first to have a complicated check in like they couldn’t find the booking or check in timing etc... But when we arrived the staffs were very helpful and let us in straight away. The room is quite small indeed but we couldn’t careless because we were out exploring things most of the time. Pool is okay. Kids were enjoying it. Cleanliness is okay too. Clean sheets and towels every day. Location is very good. Only 5 minutes walking then MRT ( exit A) overall is very good. I would recommend to all of you. We do love the location. Just within 5 mins walk from Clarke Quay station. Some good local food near by and you can even walk to China Town [around 15 mins]. The room is not entirely clean; the chair and drawer full of dust and the hair dryer is too dusty to use but apart from that it's fine. The staffs [especially night shift] are a bit not welcoming but they help you well if you ask for anything. Overall we're happy and will consider this hotel again when we visit Singapore next time.